These are for Dimitri, who emailed me requesting an ice cream sandwich recipe. Today I had eight of these ice cream sandwiches ready to photograph and six of them mysteriously disappeared from my freezer, violating the Humble Household Rule: If you don't see it on the blog then you probably shouldn't eat it without asking. Oh well. I still have two left and I can hardly blame the hungry thief. They do look and taste quite good. Unfortunately, I was feeling rather conformist when I baked these and chose a fluted biscuit cutter. You will find tall cutters work best--like biscuit cutters--as you'll be using the same cutter to cut your ice cream as you do your cookies. To keep this simple I decided to omit ice cream recipes from this post, instead giving the wafer cookie recipe and then discuss how to make these using either homemade or store bought ice cream. Yes, that's right no need for special kitchen equipment for these cuties. The following is my favorite cookie recipe for ice cream sandwiches. They're crisp, rich with chocolate flavor and stay true to shape when baked. Be sure not to substitute plain non-alkalized cocoa for dutched cocoa. For the best color and flavor you need an extra dark dutch processed cocoa powder (sometimes labeled "extra-dutch" rather than extra dark). In the U.S. Hersey's Extra Dark Baking Cocoa is easy to find in most well stocked grocery stores. In your stand mixer with the paddle attachment, cream the butter and sugar on medium-high speed for several minutes until light and fluffy. Add the cocoa powder, mixing on low speed, scraping down the sides of the bowl occasionally. Then add the vanilla and the egg and blend on medium speed until thoroughly combined. Remove the cookie dough from the mixer, wrap in plastic and chill until firm (4 hours to overnight). You can store the dough wrapped like this for 2-3 days if you wish to make it in advance. Remove your dough from the refrigerator, if it is hard as a rock allow to stand at room temperature for a little while before exercising your rolling muscles on it. In a small bowl, mix together enough flour and cocoa to dust your cutting board and your dough to keep it from sticking (a mix of 50/50 flour/cocoa). Using cocoa powder to dust will keep the surface of your cookies dark and chocolaty looking. Roll out your chilled dough to about 1/8" thickness and cut out your shapes. If anyone is curious, I used the largest of the fluted cutters from this set: R & M Biscuit Cutter Set. Arrange the cutouts on parchment paper or silpats, they spread only a little so don't be too concerned about crowding. Line a baking dish (or other flat container with 1.5" sides) with plastic wrap. How large a dish will depend on both how thick you want your sandwiches and the capacity of your ice cream maker. A 9"x9" pan or a 9"x13" pan should work well. Whip up your desired ice cream flavor, according to your machine's instructions. When ready to chill, pour the ice cream into the bottom of your prepared pan. Spread the ice cream to fill the pan evenly (aim for a thickness between 1/2" or 1 1/4") and then place another sheet of plastic wrap on top, pressing it onto the surface of the ice cream. Chill this in the coldest part of your freezer until very, very firm (ideally 24 hours). When the ice cream is cold, remove the top layer of plastic and using the same cookie cutter you used for the chocolate wafers, cut out shapes from the ice cream. Working quickly, place the ice cream cutouts between two frozen chocolate cookies and return to the freezer. If desired, roll the ice cream sandwiches in sprinkles, chopped nuts, crushed candy or any other delicious topping you can think of. Chill until firm and then they are ready to eat. The easiest way to do this is to choose an ice cream that comes in a box, one that you can unwrap completely and slice. Cut out the shapes from these ice cream slices in the same way you would the homemade method. You can also attempt to line a pan with softened store bought ice cream, as you would with the homemade version. However you need to be careful how soft the ice cream gets, or the texture will suffer when it refreezes. Again, while cutting your ice cream, place each cutout between two frozen chocolate cookies and return to the freezer. I love how delicate you make everything look. Yum those look so good. You always make me crave for things. This is the cutest idea I have ever seen! Thanks for sharing :) It is perfect for this warm weather! For sure this is perfection! Saved and printed... I can't wait to try it out. Those cookies look amazing! And I love the wrapper and string. Lady, you are so good. Yes, these are perfect. The odd thing is that drinking in your pictures is almost as good as eating itself. Give me more, give me more. Oh, and the second picture down - with the echoing loops of the furniture, plate(? ),the ties on the sandwich, and the ovals of the ice cream - is just brilliant. Wanted you to know these things don't go unnoticed. i looked @ the first photograph & thought...this is more than an ice cream sandwich...this is a work of art...the sprinkles look like a beautiful jeweled bracelet! amazing...fantastic...& to top it off...the cookie recipe looks delicious! The wire cake stand suited the sandwiches perfectly, I agree. I could also do a Top 10 kitchen tools that have injured Ms. Humble. I agree with all the above commenters that these are no mere ice cream sandwiches, and you are more than correct to call them perfect. The wrapping and the string was a lovely touch. I noticed from one of your previous posts (I think regarding "pretty blog guilt"), that you took a shot of your set up for photographing your food. The shot included your tripod etc., but do you have any light sources you use or just natural light? I almost always use natural light. Only on those dark, desperate Seattle days do I pull out my ramshackle 'lighting' equipment (basically naked full spectrum bulbs) and try to shoot. It never looks as good though. These look so delicious and beautiful! I am absolutely making these this summer! Thanks for the cookie recipe! I have tried this a few times and never been satisfied with the way the cookies turned out. Can't wait to try this one in the summer! Fine I'll admit it, I ate them. There I said it. They looked so good. Oh, this is great!! I needed a good recipe for perfect wafers on ice cream sandwiches. And I have the dark cocoa right now! Woohoo! I'm making this very soon. I love the Humble Household rule! LOL! Just corrected an error in the recipe. The butter unit was incorrectly listed as 'cups' rather than 'sticks'. If you've printed or saved the recipe please note the change. You funny gal, you. I just found you and I love you already. Love you, I say! This pretty lil' post of yours made me scroll down to the next. I laughed out LOUD and shook my head in agreement at your Pretty Blog Envy/Guilt/Revelation. You are a darling and I think we ought to be friends forever. I'll be checking in on your site OFTEN to see what you're cooking. ohhh i love love love these. the wrapping, the sprinkles. and the ice cream. i'm a firm believer that ice cream cures all problems. these suckers could probably end gang violence and provide universal health care to all. at the same time. Your pictures and recipes are always so awesome- I can't deal. I just want to climb right onto the page and eat it all! Gorgeous! Must trying making some ice cream sandwiches. I really want to find some extra dark cocoa but haven't found it in the UK yet. Your rule would never work in my house, since I often don't have time to get a post up until days/weeks after I've finished a recipe. And anyway, with ice cream sandwiches as tempting as these? I really can't blame the culprit for breaking the Humble Household Rule! Yummmmm, just beautiful and elegantly photographed. these are BEAUTIFUL! you are amazing...everyone asks me where I find the time, but YOU...you put 500% into your passion. you go girl! So beautiful, and I bet it tastes like heaven! I have to make this. That means I will have to try and resurrect my poor, broken ice cream maker. btw, I hunted high and low for dutch chocolate in my town. The only place I could find it was at Penzey's. I imagine they ship things all over the world from their website. I've been searching for a great ice cream cooking recipe and I hope I can stop looking now! Thanks for the great post. When I make ice cream sandwiches like this with store-bought ice cream, I use the cookie cutter as a mold for the ice cream. Set the cookie cutter on a square of parchment, and then line the inside with one or two strips of parchment that are a bit wider than the height of the cookie cutter. Fold over the excess parchment around the top of the cookie cutter to help hold it in place, but it doesn't have to be perfect. Then I use a spatula to press slightly softened ice cream into the mold, and cover with another square of parchment. You can unmold it after 1-2 minutes in the freezer, then the ice cream centres will keep in the freezer for a day or two in a ziploc bag. Resolve: I always crave ice cream sandwiches when I definitely DON'T want to turn on the oven... How long do you suppose the cookies will stay palatable in the freezer? The cookies themselves will keep for quite a while wrapped and in an air tight container. At least a couple months, I suspect. Over time, the wafers will lose a bit of their crispness but not so much as to make them unpalatable. 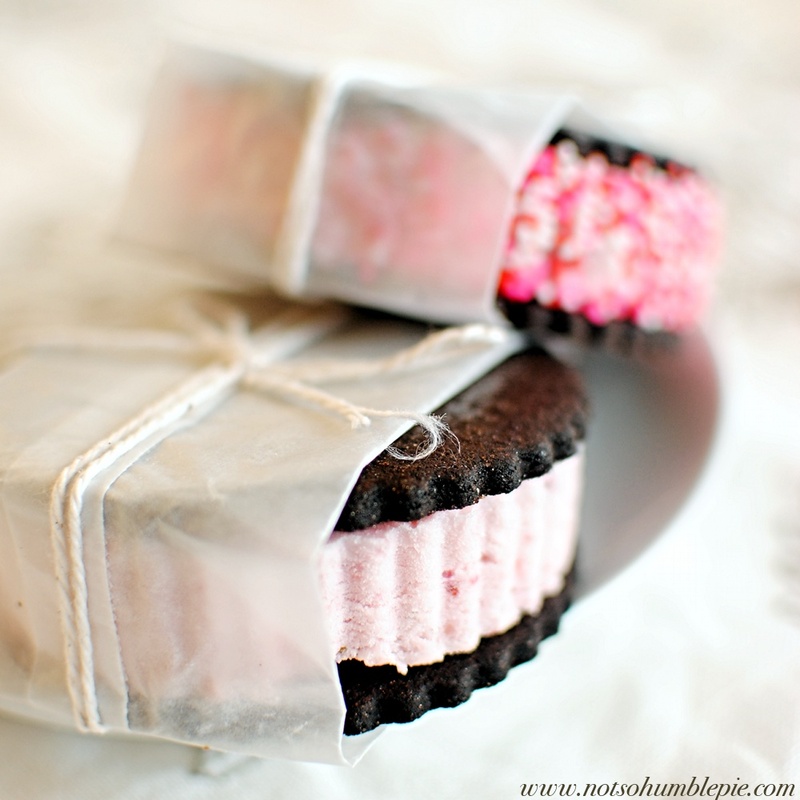 The ice cream sandwiches look divine! So divine that I am in the middle of making them right now,(even made my own ice cream!) but I have a question. The dough for the cookies seems to be very soft , even after many hours in the fridge. I have the cutouts in the freezer right now because they became too soft to lift up. Any suggestions? When the dough is warm or even room temperature it can be too soft to work easily. When it is completely chilled it should become very firm and easy to work with (until it warms up again). As for the cutouts being too soft to lift, I think you're doing the right thing by letting them sit in the freezer to firm up. Once they're solid you should be able to transfer them to a baking sheet. You might consider making a flat-ish patty out of the remaining dough and wrapping it, then placing it in the freezer too. It will chill quickly in there and should be come firm enough to easily work with. this dough is IMPOSSIBLE to work with!!! holy cow, it is very very soft and melts within seconds. Hope you have better luck with another recipe. Though I assure you, the dough is workable when thoroughly chilled. I had little trouble with Fran's recipe in my own kitchen. ms. humble! wanted to let you know that your dough recipe was lovely, chilled up perfectly, held it's shape, and is tasty. thanks so much for sharing!